Dogs and cats are the most popular indoor pets (with 24 per cent of Brits owning a pooch and 17 per cent owning a kitty), followed by indoor fish (eight per cent), rabbits (two per cent) and indoor birds (two per cent). But you shouldn’t have to give up your beloved pet just to have a roof over your head! To help you secure the rental property you’re after, here’s our guide for pet owners looking for a new rental property. Before you even start browsing through the properties available to rent on Mouseprice, you should think a little about your pet and the type of property that will suit them best. Perhaps your dog is old so you want to avoid a lot of stairs; maybe a garden/outdoor space is essential; or possibly your cat likes to go out and roam the streets, so it’s best to avoid 8th floor flats and busy main roads. Make a list of what you’re after, but remember to be flexible. You might dislike landlords that don’t allow pets, but then you don’t know the history that landlord has hand with previous tenants’ animals. An out-of-control pet can cause havoc to a house or flat, but you can be responsible by ensuring your pet is trained and kept in the appropriate manner at all times. You might even want to knock up a ‘pet CV’ – to show the obedience courses your dog has been on, for example. 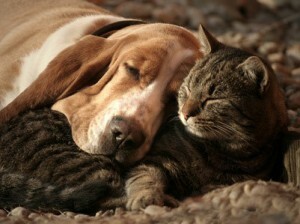 The biggest mistake we see pet owners looking to rent make is leaving it too late to look for pet-friendly properties. You should be searching for a new place at least two months before you need to move out of your current dwelling; that way there will be properties available for you to view in the run up to moving day. The biggest reason landlords are often down on pets? It’s not because they dislike dogs and cats – it’s because it costs them money when they have to replace scratched furniture and other damage. By offering a bigger deposit at the beginning of your tenancy, you’re reassuring the landlord that should any damage occur as a result of your pet, the cost is already covered. This is particularly important when you go to move out of a property, and yet it’s something you must ensure you do before you even let your pet inside! Written permission from the landlord (showing that any ‘no pet’ clauses have been removed from your tenancy agreement) will cover you should there be any misunderstandings down the road. Just make sure you keep it somewhere safe! This is very important, and could be included when you first pay the deposit. Anyone with a dog or cat knows that the little scamps can sometimes leave a mess behind them; whether it’s through moulted fur or muddy paw prints. Assure the landlord that you will pay for a clean-up where necessary (e.g. getting areas of the carpet cleaned) when you move out, so the property will be spick and span for the next tenants. All that’s left to do now is start browsing for your new home!